Reading allows us to discover worlds filled with great, imaginative characters – like dinosaurs and tigers. 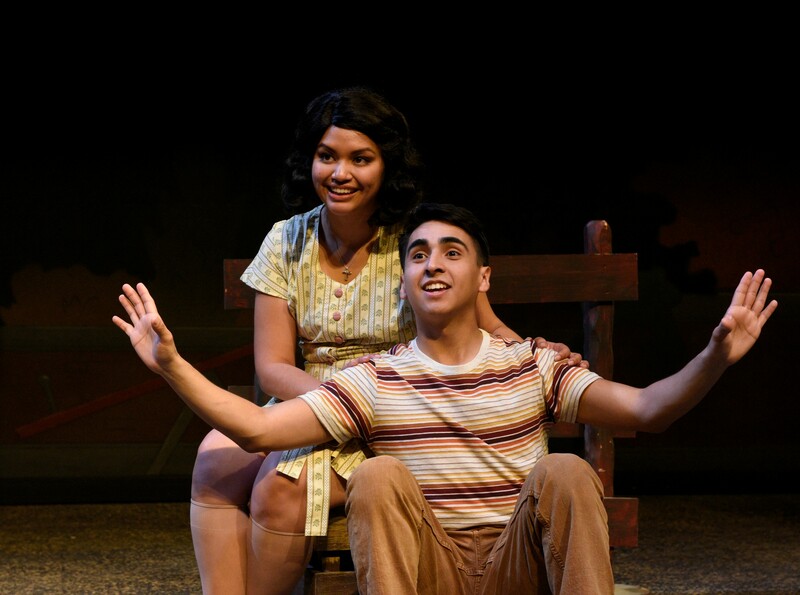 Before TOMÁS AND THE LIBRARY LADY opens on March 24, we talked with director Robyn Flatt to learn more about the production. Describe TOMÁS AND THE LIBRARY LADY from your perspective. Tomás is a young child struggling to find his place in the world. He’s having a terrible time at school, partly because he is in and out of different schools so much, and he doesn’t get a chance to really know anybody. He doesn’t speak the language that the teacher speaks so even though he tries, he’s not able to keep up. He’s mistreated because people are impatient with him and they think he’s stupid. People miss him as a person because he can’t compete on the level with the other students. I relate that to my daughter who has dyslexia, a learning difference which I didn’t even know she had until she was in the 2nd grade. Unlike Tomás, she was very verbal and could pick up stories to tell and relate them to everybody, but when it came to reading, she just couldn’t do it. Many of her teachers were in a way a little bit mean to her, and I think that’s exactly what we see in this play. I think it’s not only someone who has a language difficulty, but anybody that is not somewhere in that “normal” range. Anybody that comes in that is different in any way is subject to being ostracized or bullied or dismissed; at least made to feel ignorant and not worthwhile. Give me 3 words to describe TOMÁS AND THE LIBRARY LADY. I think it’s an inspiring story because it’s real. 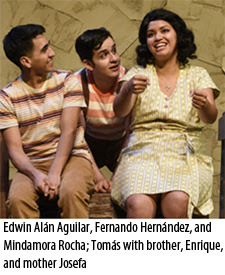 It’s very imaginative, and it highlights some of the really beautiful parts of family that are inherent in the Latino culture. 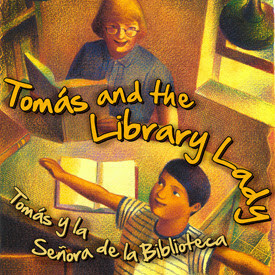 What do you like most about TOMÁS AND THE LIBRARY LADY? I like most that you see the world from the point of view of the child. You see his struggle, and you empathize with him and then you celebrate with him at the end. What experience are you trying to create for audiences viewing TOMÁS AND THE LIBRARY LADY? I want them to have a good time. I want them to enjoy it. I want them to appreciate the Latino/Hispanic culture. It’s a migrant family, and we don’t tend to value them very much. Just because someone doesn’t speak my language doesn’t mean they’re stupid. If you’re in their country, you don’t feel that way about yourself. I think it’s great! I think it’s fun because you get to shape a story. You get to work with all these different individuals, not only the cast members, but the designers around the show, to help bring it to life. It’s a discovery; it’s developing your curiosity and sharing that with other people. I’m very much a team player, therefore I really like hearing the ideas of the other people, and I think my job is to bring those into a unified whole. That way, the story we tell is as strong and cumulative as possible. All my life I’ve seen this. I’ve seen kids come in who were very shy and felt kind of outcast. They weren’t accepted in the sports world or they weren’t the top of their class. They weren’t on the school council, or one of the popular kids. So their school sort of tells them, “You’re not up to par, you’re not worthy.” They come to DCT discover who they are and that they can do something other people can’t. The great thing about theater is the diversity of skill, culture, and age – all of that is what makes it work. So we value all of those things, and when we put that together and that kid feels part of a team, he feels the energy of the larger picture and it propels them; it changes their life. For instance, I had a father of this kid who completely changed because of DCT. I needed the father in the show but his wife said you can’t be in that show unless you take our child with you. So we had the kid [there at rehearsal] but we didn’t really have a part for him, and he really didn’t have much experience. I decided to make him a junior pirate, and he was there doing some of the things the pirates did. The kid was very hyper and moved around a lot, but he was in the show and actually ended up doing a pretty good job. The next year, I needed the same actor so he came and he said, “I don’t know what you did to my son, but he was struggling to make C’s and since that experience, he’s making A’s. He learned how to focus; it’s just took a simple little thing like giving him a chance and a way to express himself. I love the multigenerational audience, so that leads you kind of away from doing the avant-garde and some of the other really harsh stuff. I feel like there’s a lot of energy going into theater for adults already; I don’t think there’s enough energy going into quality arts for young people. Since the schools have dropped out on that, it’s imperative that we have really strong, quality programs for young people and their whole families. That’s where we’re going to inspire the next generation, and if we’re not doing that, we’re not doing our job. One really memorable thing: I’ve had the joy of directing [Eva’s] script now several times, and she’s come every single time and talked to the audience afterwards. She is a Holocaust survivor; she has the tattoo number on her arm. She’s one of the bravest, most optimistic, open, wonderful people I’ve ever met. The way she handles talking to kids about her experience is wonderful. After the show, she would stay there for however long people wanted to talk. We had to cut it off after a while. She would stay and answer questions one after the other. They would ask tough questions, but she always responded with beautiful answers. What’s your favorite children’s story? Why? The play, TO KILL A MOCKINGBIRD inspired the opening of the theater, but The Secret Garden is my favorite children’s story. Alice in Wonderland also has a special place in my heart because I grew up reading those stories. 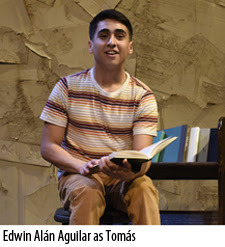 Join us for a performance of TOMÁS AND THE LIBRARY LADY, and gain a better understanding of the sacrifices some parents make to give their children a better life. 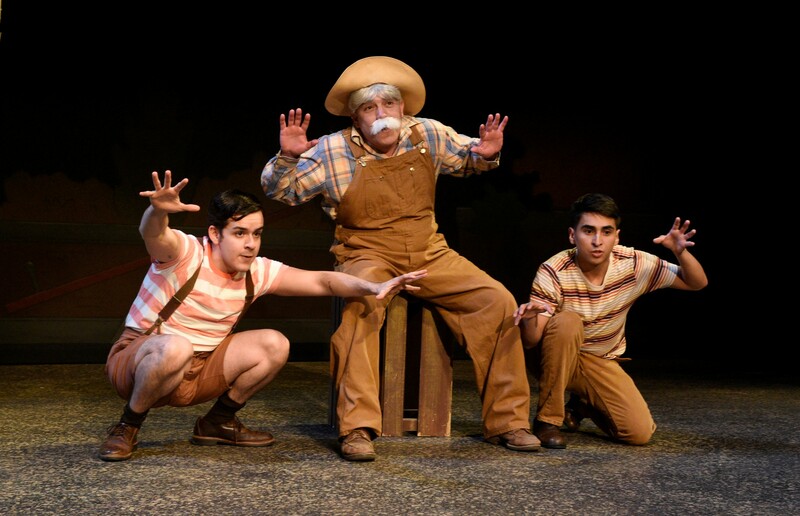 This inspiring true tale of how reading and stories help us all escape is on the DCT mainstage from March 24 – April 2. For tickets and additional information about the show, visit dct.org. 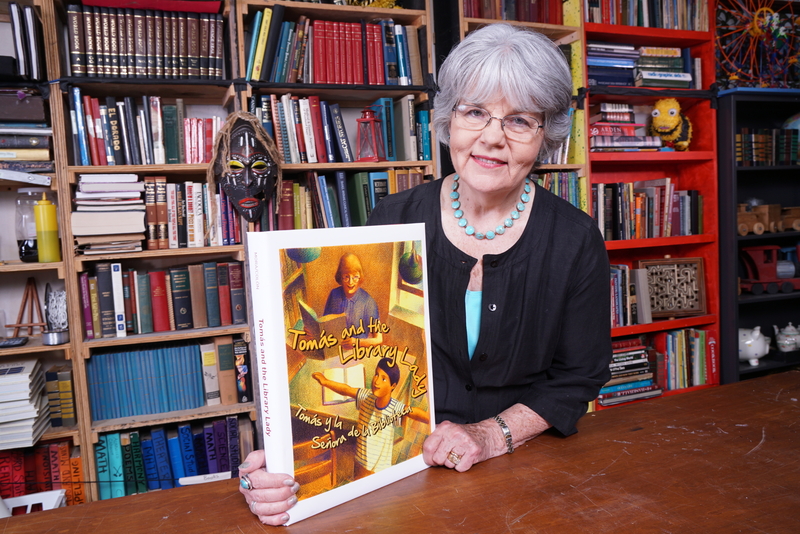 What might be surprising is that the book by Pat Mora is based on the true story of Tomás Rivera.The story becomes even more inspiring when we see how Tomás used his love of reading to become an author and educator. 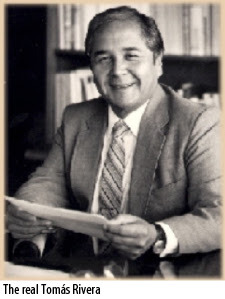 He also became the first Mexican-American to serve as chancellor at the University of California. Tomás grew to appreciate the real value of learning thanks to sparks ignited in his brain by attentive and caring people who had a passion for education and knew of its benefits for a young boy. Once inspired, Tomás was diligent in the pursuit of his own education, but he was still taking every opportunity to help his family during busy work seasons. This meant that Tomás had to work even harder to keep up with school. He wrote about these experiences and the difficulties faced by lower-class Mexican families, and today his legacy is that of a role model and a community advocate. 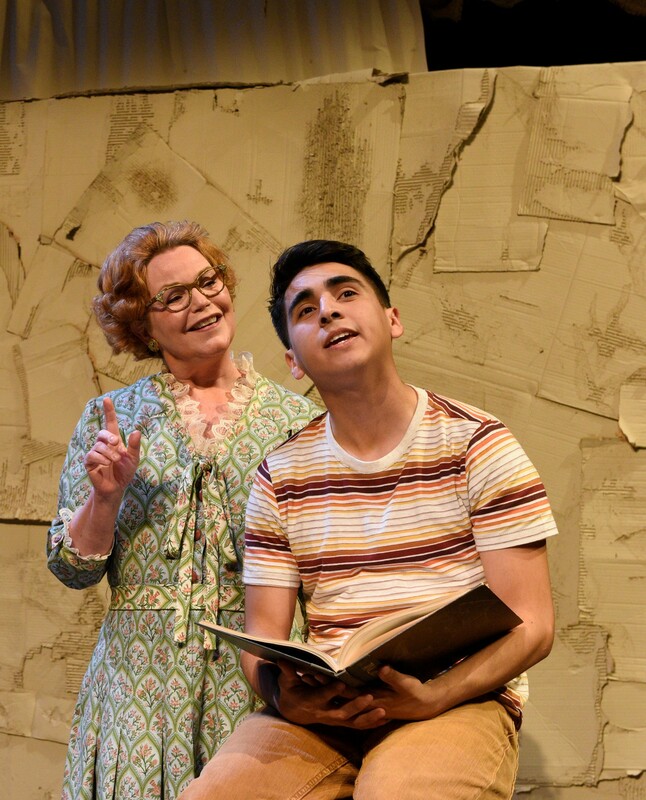 The play TOMÁS AND THE LIBRARY LADY focuses on his experience as a young bilingual student, and hopefully it will inspire all students to work hard and find the value in reading. Even though you see the struggles of moving from place to place to find work, you also see the lighter moments such as when Papa Grande tells wild imaginative stories; proof positive that those family moments really do matter. TOMÁS AND THE LIBRARY LADY runs March 24 – April 2 and is recommended for ages 7 and up, and is bilingual. All families are welcome! Please join us. Visit dct.org for more information. An inspiring true tale of how reading and stories help us all escape. 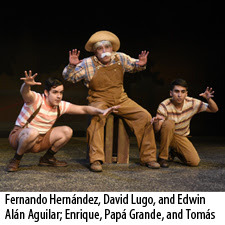 This beautiful bilingual play follows the life of young Tomás and his family, who are migrant workers who move constantly to find new work picking farmers’ crops. But one summer, Tomás visits a local public library and soon discovers worlds filled with dinosaurs and tigers — and a great new friend in the “Library Lady.” While helping Tomás improve his English by reading many new and exciting stories, the librarian fosters his newfound interest in learning and teaches him the importance of a good education. I’m not sure if my kids actually know what happened to Little Red Riding Hood. 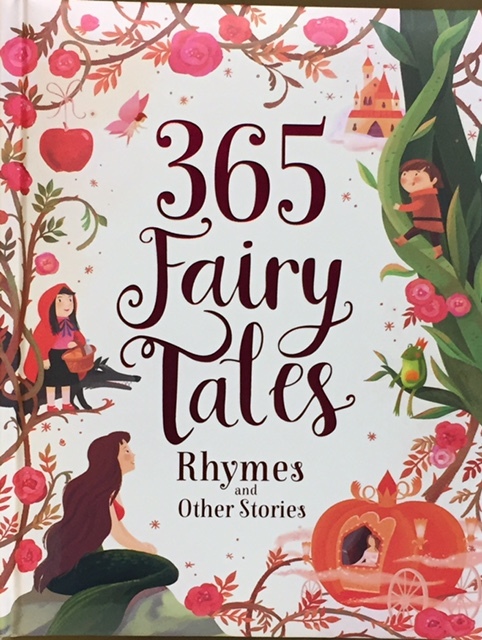 It’s a fairy tale, and for some reason, fairy tales have not been in our collection of bedtime stories. Like many of my peers, I rely on Disney to turn fairy tales into movies, and then cross our fingers that they sink in enough to stay in the realm of important tales with a moral lesson that get passed on to the next generation. 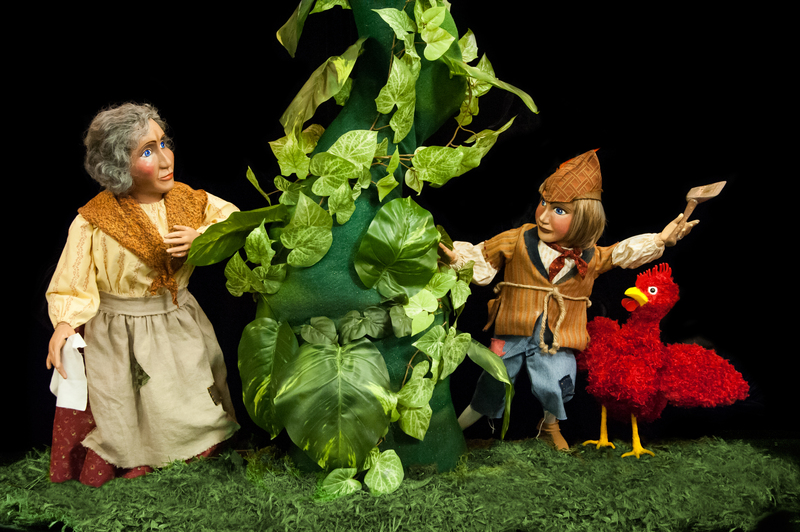 As they prepared for the production of JACK AND THE BEANSTALK, puppeteers and directors Sally Fiorello and Doug Burks talked about the picture books that would absorb them for hours as children. I remember those books; I had them too. The artwork was beautiful, taking up the whole page, and the language was colorful and at times, so complex that someone would have to read them to me. After the first read, the pictures were all I needed to get through the story the next time. My memory and my imagination would do the job, and like Sally and Doug, I could spend hours lying on my belly staring into the world of the book. My eyes were on the book, but my mind was in the world of the story. I was fortunate to know Professor Jack Zipes during my time at Children’s Theatre Company in Minneapolis, and his studies in Comparative Literature at the University of Minnesota focused on fairy tales. He went so far as to say that fairy tales not only stretch a child’s imagination, but also develop critical thinking skills. It seems bold to say that a story could have that much of an impact. But think about it. If you’re familiar with those Grimm brothers, you know that the stories have been softened a bit through the ages. We don’t focus on Hansel and Gretel’s father, and why he sent them into the woods by themselves to face a cannibalistic witch. We like to talk about the house made of candy and how resourceful the brother and sister are together. We don’t want to scare our children, because we know how powerful their imaginations are, and fairy tales have powerful triggers in them that can ignite their brains into…thinking. With our production of JACK AND THE BEANSTALK, Jack’s quest begins as he tries to make some money to take care of his sick mother. At this point, children are absorbed by the live picture book that Kathy Burks’ puppets create in the theater. 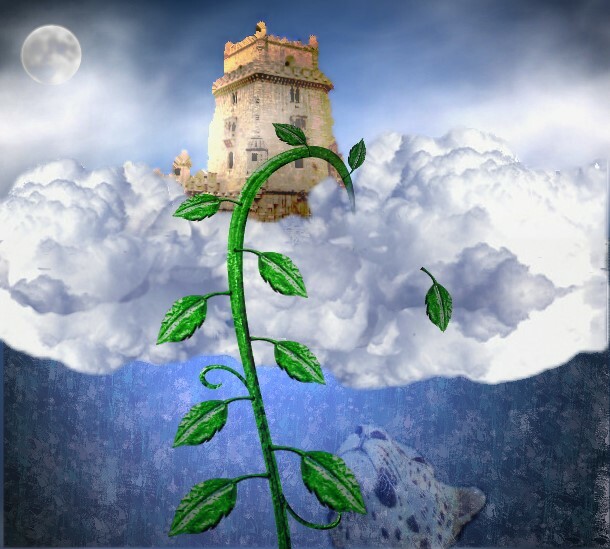 There is magic as a beanstalk grows, there is laughter with the scene-stealing Goldie the Hen, and like any good fairy tale, there are lessons to learn. Imaginations will be firing on all cylinders. Of course you can’t have JACK AND THE BEANSTALK without a giant who poses a threat, but it’s okay. Ultimately our kids’ will be left with an unbelievable adventure, and our children’s resilience when faced with the scary simply helps better prepare them for the real world. 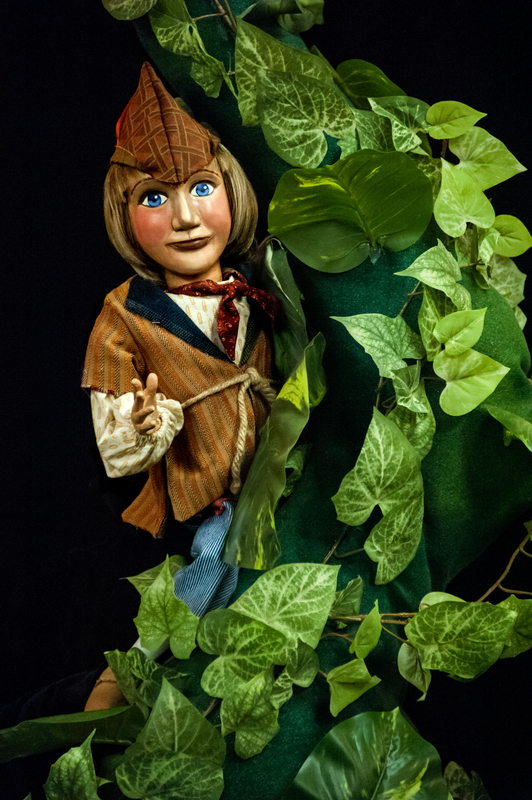 Kathy Burks Theatre of Puppetry Arts’ JACK AND THE BEANSTALK runs March 3-26. 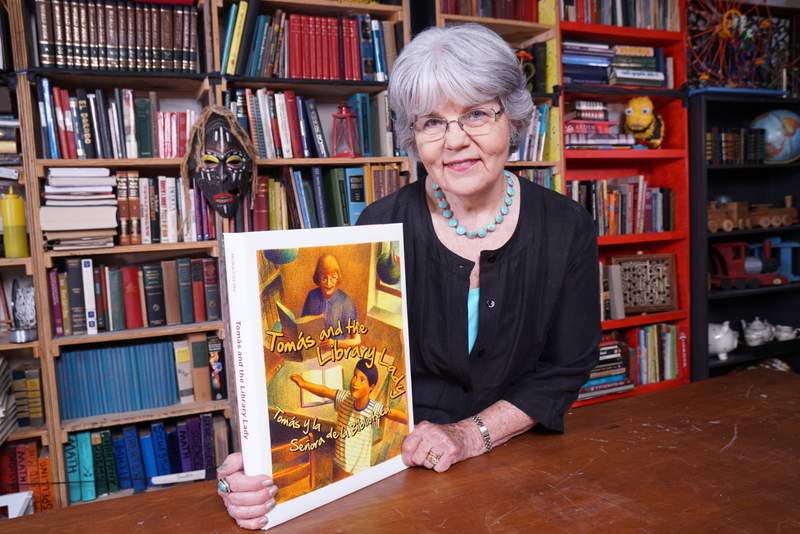 For more information, visit dct.org, and maybe pull those picture books out of the attic. After you get immediately transported back to your own childhood, share them with another hungry imagination. When families decide to grow their own food, they are investing in the health and wellness of those they love the most. Parents can involve children in that process by planting seeds with them, and looking after the seeds as they grow tall and strong. Through the process of nurturing a seed and watching it grow, children experience firsthand the value of hard work and providing necessities, like food, for their family. 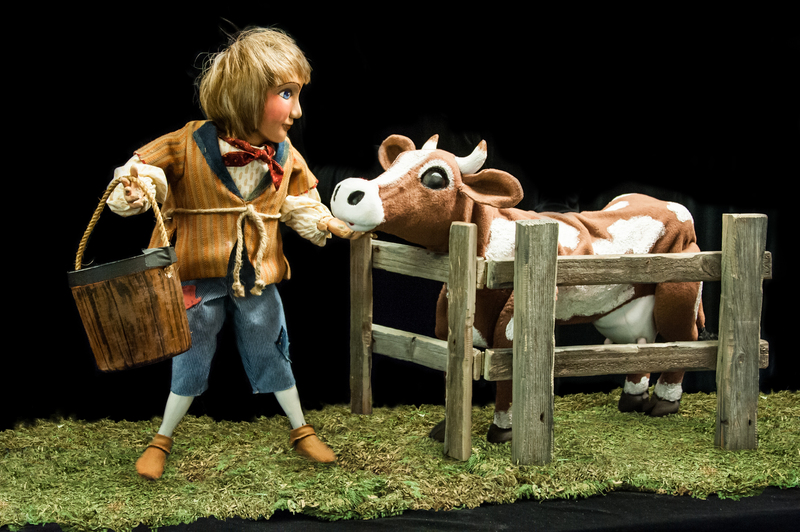 In Kathy Burks Theatre of Puppetry Arts’ JACK AND THE BEANSTALK, Jack and his mother fall upon tough times; there is no hay to feed their cow, Milky White, and no way for her to produce milk for them to sell in the market. As a result, the mother makes the difficult decision that they must sell her. Mother knows that the money they earn from selling Milky White will provide them with enough for food and medicine for a period of time. As parents do, Jack’s mother made a sacrifice that wasn’t easy, but it was for the benefit of her family. When Jack returns home soon after leaving to sell Milky White, his mother is skeptical about what he is returning with…and for good reason! Parents want to make sure their children are well cared for, that they have everything they could ever want or need. Unfortunately, doing so can translate to a lack of appreciation for the hard work it really takes to provide for those growing needs. We see this dichotomy come to life when Jack returns, ecstatic about the magic beans he just landed, only to have his mother display much less than a positive vibe. Jack, like all good, honest children, doesn’t want to let his mother down, so he climbs all the way up the beanstalk in search of a fortune that will convince his mother that the beans he got in exchange for their precious cow are truly magical. 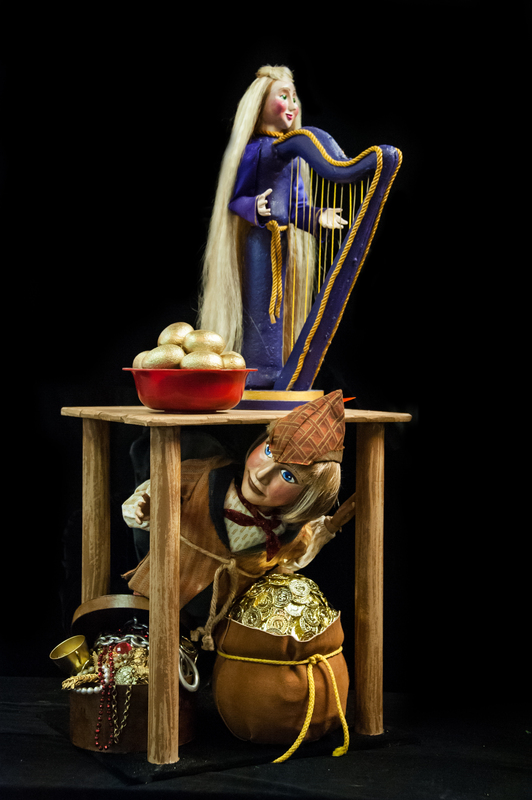 Inside the Giant’s castle, Jack meets Goldie, a hen that lays golden eggs; and Esmerelda, the woman who takes care of the Giant; both of whom feel their hard work providing for and making the Giant comfortable goes unnoticed and unappreciated. Seeing the Giant speak rudely to two who are so helpful motivates Jack to save them. If it weren’t for Jack experiencing Goldie and Esmerelda’s struggle to survive firsthand in the Giant’s castle, he may never have understood the difficult decision his mother made to sell Milky White. Like all fairy tales, Jack and his mother’s story has a happy ending—but you’ll have to see the show to find out just how he defeats the Giant. 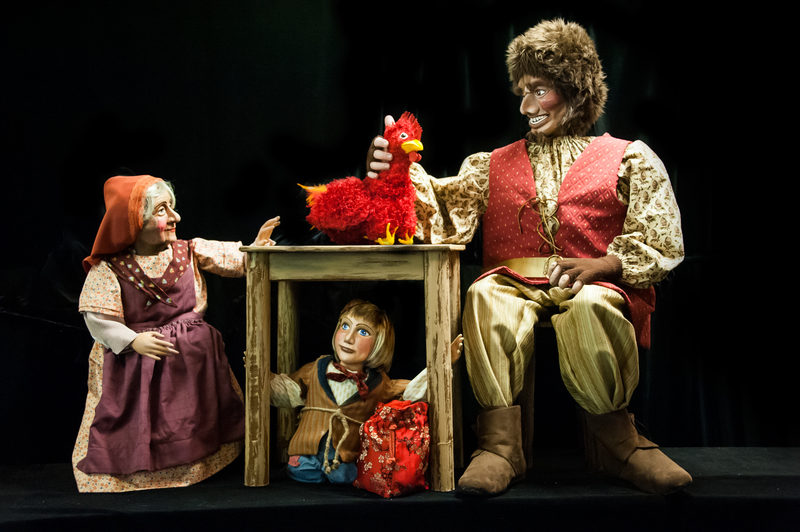 And trust me, even if you think you’ve got this fairy tale down, you owe it to yourself to see the surprises and gentle moments that only Kathy Burks Theatre of Puppetry Arts can provide. Be sure to arrive a little early to start your own garden working with a member of the Green Thumb Team in the DCT lobby. There will also be a Jelly Bean guessing contest you can enter! No beans, I mean, no bones about it, the entire family will have a great time. JACK AND THE BEANSTALK runs March 3 – 26. Tickets on sale now. Plan your visit at dct.org.